Solar Airplane's Round-The-World Trip Is Halted Until 2016 : The Two-Way Battery problems on the Solar Impulse, the airplane that has been flying around the world using only the sun's power, have grounded it until next spring. 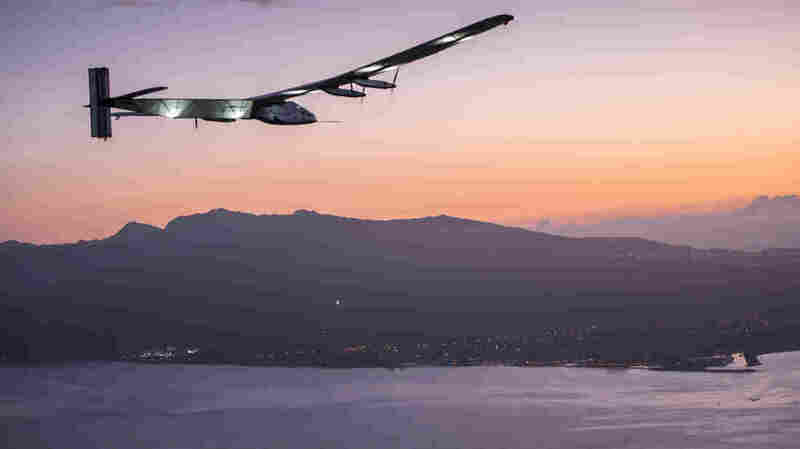 The Solar Impulse 2 landed in Hawaii in early July. The team behind the sun-powered airplane says it will be grounded until next spring. Battery problems on the Solar Impulse, the airplane that has been flying around the world using only the sun's power, have grounded the plane until next spring. The lithium-ion batteries overheated on a recent five-day trip from Japan to Hawaii. "Irreversible damage to certain parts of the batteries will require repairs which will take several months," organizers said early Wednesday, ending hopes of finishing what would be a record-setting trip by late summer. The Solar Impulse was nearly halfway through its circumnavigation when its managers announced a problem over the weekend, saying that the "battery temperature increased too much due to over insulation." The setback comes after the plane's nearly 118-hour trip from Japan to Hawaii shattered the previous record for the longest duration nonstop solo flight, with pilot André Borschberg (one of the craft's two alternating pilots) at the controls. On that flight, the problem set in almost immediately. The Solar Impulse team says that after an initial high climb overheated the batteries, they had no way to bring the temperature down during the rest of the long trip. "Overall the airplane performed very well during the flight. The damage to the batteries is not a technical failure or a weakness in the technology but rather an evaluation error in terms of the profile of the mission and the cooling design specifications of the batteries. The temperature of the batteries in a quick ascend / descend in tropical climates was not properly anticipated." Showing the optimism that would make someone embark on a round-the-world trip on a sun-powered airplane, Borschberg said Wednesday that the concept is sound, "despite this small problem that we have with the batteries." And, he added, the crew is lucky enough to be forced to work in Hawaii, where the plane has found a temporary home thanks to help from the University of Hawaii. "This is the greatest airport that we could find," he said. "We have fantastic people who help us, we found a hangar to put the airplane through the winter and prepare it for next year." When it flies, the Solar Impulse follows a pattern of soaring to 28,000 feet during daylight conditions, then using battery power as it glides at slower speeds for much of the night. For the 4,481-mile journey from Japan to Hawaii, its average ground speed was around 38 miles per hour. Between now and next April, the Solar Impulse team says, they'll work to repair the plane's batteries and try to figure out a better cooling and insulation system. Then they'll try to resume the trip that began in Abu Dhabi in March. As we've reported, the plane "has 17,000 solar cells on its surface; it stores power in lithium-ion batteries that account for about 1,400 of the craft's overall weight of some 5,000 pounds." Many of those solar cells are on the plane's huge wings — which present their own aviation challenge. As NPR's Steve Henn reported about the plane's prototype in 2013, the Solar Impulse's slow speed and wingspan of more than 200 feet means that "even a slight bank can cause the tip of the inside wing to lose lift." Steve added, "Pilots only turn a few degrees when flying the plane, because if they turn too sharply, the Solar Impulse could tumble out of the sky. So designers created a unique physical warning system that vibrates the pilot's arm when a turn is too steep."